Are cars no longer elegant? Are cars no longer elegant? Apparently not, says Ikuo Maeda, head of design for Mazda. Talking at the preview of the brand’s new Vision Coupe luxury grand tourer the night before Tokyo motor show, he said: “Not many cars these days can be described as elegant." He adding that “the state of cars is so complicated”, elegance can not be achieved. 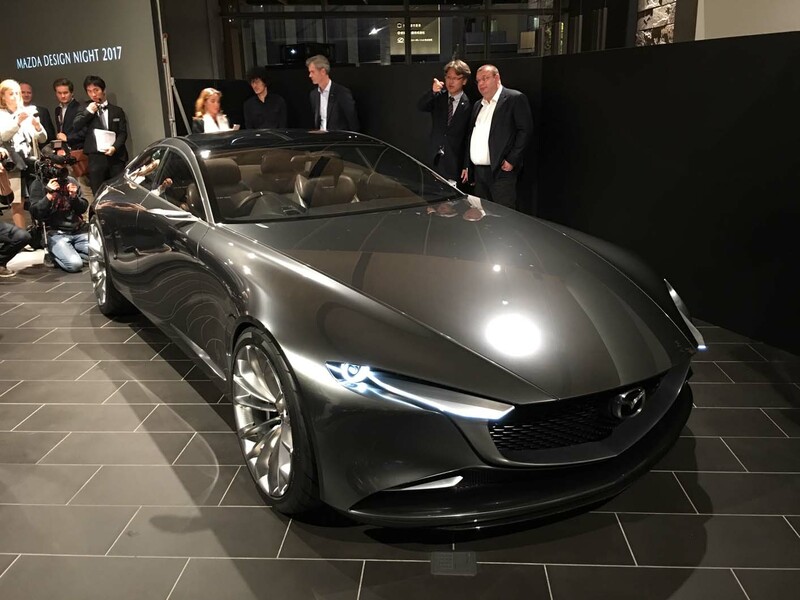 But elegance is exactly what Mazda has aimed for with its new Vision Coupe concept, a sporting grand tourer that, at least conceptually, could rival an Aston Martin in the looks department. Mazda uses lots of Japanese philosophy to describe its design ethic – most of which sounds like mumbo jumbo – but in essence, it is all about trying to achieve a minimalist aesthetic. “In Japan, in space where there is nothing, we see beauty. The empty space becomes the canvas,” says Maeda. Whether Maeda was having a dig at other car makers with his elegance comment wasn’t clear, but there’s certainly lots of awkward-looking lines on modern cars – the new Nissan Leaf springs immediately to my mind, along with plenty of Toyota models. The Vision Coupe isn’t due to make production, instead showing the second generation of Mazda’s so-called Kodo design language, but Mazda has absolutely achieved an elegant-looking car, with incredibly smooth lines, an impressive sweep on the body shoulder and an almost never-ending bonnet. The concept took two years to create and was largely handmade from clay. It went back and forth from clay modelling to digital modelling to achieve the incredibly clean surface that the final version features, according to Maeda. We’re yet to see how this ‘elegant’ design translates into production models, but based on Mazda’s recent efforts, it has carved a place for itself as having the most handsome of Japanese models. And you know what? It could be a very smart move indeed. In an era when 'there are no bad cars', or 'all cars feel the same', there's one thing that can really help your models stand out: design. When the margins between cars are so small, design could make all the difference when it comes to the buying decision. Car design nowadays is about designing everything to look like tonka trucks, modern traffic is like something from a dystopian future where everything is an SUV / urban assault vehicle. Compare modern cars against those from the 60s-90s, so much more elegance in design. Compare an Alfa Spider to an Alfa Stevio and see what I mean. My problem is the lack of innovation or ideas. When the current A class replaced the astonishing packaging of the original you know that Mercedes has become market- rather than engineering- or concept- led. When the conventional Polo based A1 replaced the avant-garde A2 you know that Audi is going down the same commercial route as Mercedes. When Fiat relies on the retro 500 to keep it going instead of designing great little cars like the 124, 128, original Panda, original Uno, Punto etc. you know that the car industry has become conservative, cautious and boring. I read a lot of stuff and i found that the way of writing to clearifing that exactly want to say was very good wi-fi names so i am impressed and ilike to come again in future. Detailed guide for iCloud sign in account. Learn how to login iCloud account on iPhone/iPad/iPod.